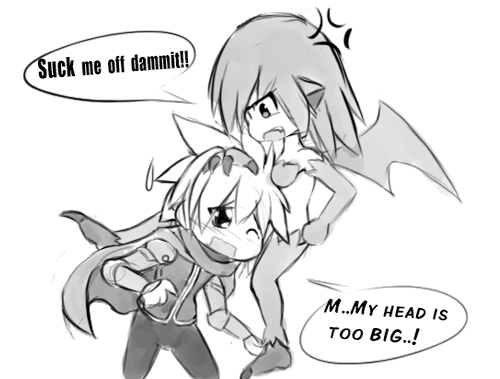 Kyrieru: The trouble with Chibi sprites..
That probably made me laugh a bit more then it should've. That is funny. Wouldn't changing the angle deal with the problem? Say by having one of the characters viewed head on rather then on a profile? You can use a pose like the (cat girls?) grapple in Kurovadis, or would it be too submissive? Hahaha, it's a serious problem for an h-game. It wouldn't be too big if she were a futa! Um....just a suggestion! would become a male blowing a futa. That's a different fetish/theme. I wouldn't worry too much, sprites are not necessarily meant to be anatomically correct. Most people will enjoy it even if it looks off a bit.